Concorde with Pier Raymakers, the silver medal winner in Barcelona, was the spectacular winner of the 1990 National Stallion Championship. His outstanding performances at an early age earned him the pre-fix Olympic. His prestige remains phenomenal with Jos Lansik, given their success in Dortmund, Paris and Darmstatt. Henk Nooren, a pre-eminent called Olympic Concorde a stallion that has everything and that will grow into an absolutely world class horse. In 1995, he was awarded the status of Keur at the World Championship for young horses. Concorde comes from a strong jumping line on both sides. Sire of this stallion is the impressive VOLTAIRE, who is bred to perform. 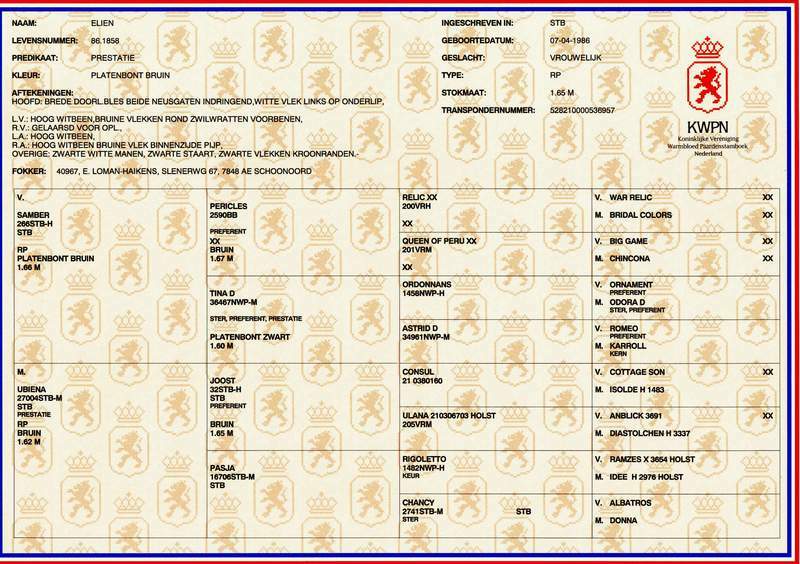 He has already sired 5 approved stallions in the Netherlands, one in Belgium, two in Germany and one in Sweden. Through the performance of his offspring Voltaire stands very high in both dressage and jumping indexes. The progeny of Concorde are bold horses with an efficient trot with balance and an outstanding canter. They have demonstrated jumping style, movement and ability. Many have earned "ster" and "keur" predicates. As an 8 year old VOLTAIRE jumped 1.50m courses with a great deal of success. He showed his prowess in international jumping in 1988 in Calgary, Stockholm, Lanaken, Helsinki, Weisbaden and Wembley. In 1989 he brought his successful career to an end by winning the Grand Prix of Berlin. Voltaire stands very high on the index for dressage and jumping. Voltaire is the result of crossing two outstanding bloodlines, FURIOSO II and GOTTHARD. FURIOSO II produced 200 state premium mares and at least 68 approved stallions of which several are standing at stud in other continents. One can easily say that FURIOSO II and GOTTHARD. FURIOSO II has influenced the breeding industry worldwide. 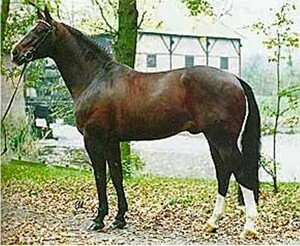 The dam's sire GOTTHARD is, now more than 12 years after her death, almost a legend in German sport horse breeding and her name is synonym for the Hanoverian show jumper. 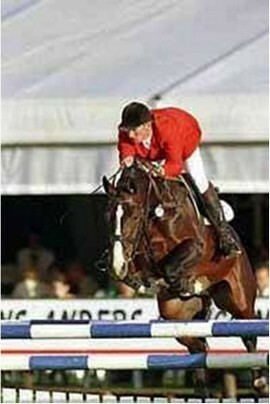 CONCORDE's dam, FLYER, produced at least six international showjumpers. CONCORDE himself won the Grand Prix of Nordrhein-Westfalen at Aachen and was Champion of the Netherlands in 1992 CONCORDE was the sire with the most offspring at the World Breeding Championships for young horses in 1995. His offspring on the international jumping circuit include GRACE (Nona Carson). HUMFREY (Franke Sloothaak), GRACIA (Carolijn Lancaster) and HOLLAND (Eddie Macken). CONCORDE has numerous approved sons, including JUMBO JET, CASSINI, HOLLAND, LAGANO'S DOUBLE, KASTELLO, JACORDE, JOYRIDER, JAZZ and LORENZO. SAMBER DUTCH, Warmblood stallion with the "Golden Temperament" scored 10 for temperament and trainability at 100 day testing in Holland. SAMBER has competed very successfully in Europe through Grand Prix level Dressage and the Z levels in jumpers, mostly with a junior rider. SAMBER is by two highly rated Dutch Horses - PERICLES: a preferent rate stallion and TINA: a ster. preferent, presteinte rated mare. SAMBER has consistently been very highly ranked on the index (400 stallions on average) for both dressage (top 20's) and jumpers (top 100's) for producing offspring excelling in these disciplines. Samber has sadly been put to sleep aged 33, Samber was the first and only coloured stallion approved by the KWPN and has been the most influential coloured stallion of all times. SHOVERN STUD FARM TOP COLOURED SPORT HORSE BREEDING AND HORSE SALES.